We admit, not everyone uses or requires weather apps, but other than making your homescreen look fancy schmancy, it lets you plan out future events depending on predictions. Most of the new weather apps not only provide weather information, but also come with customizations to make your homescreen more attractive. 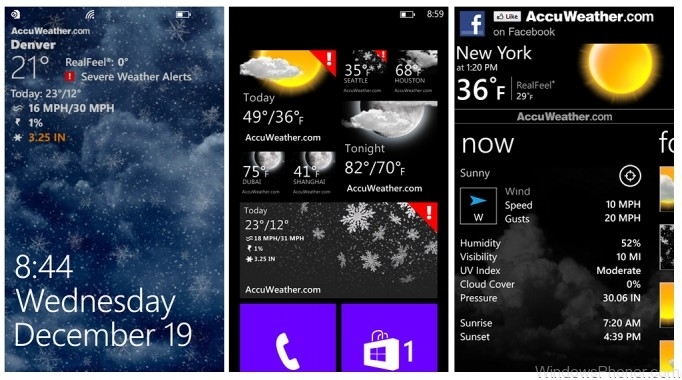 So here are the 5 best weather apps you can get for your Windows Phone 8 device! Whether you like minimalism or an overload of information, you will find an app you like in our list! Amazing not only in name, this app has always been a favorite with Windows Phone 8 users ever since its launch. It’s one of the largest weather apps, weighing in at around 85 MB, and includes fantastic graphical animations depending on weather conditions. There’s two themes you can use here, Metro and Realistic. Metro is for the minimalist, and is very light, although it features all the same information like in the realistic theme, which is really attractive and changes based on current weather. Amazing Weather HD also changes your lockscreen image if you allow it, and is able to display either current, hourly or daily forecast. There’s also a lot of options for the live tile, so you won’t be disappointed at all. An app from one of the most trusted names in the business, The Weather Channel is a great app that satisfies all your meteorological needs. It’s a rather simple app and doesn’t come with lockscreen customization or fancy animations, but includes all the information you’d need. 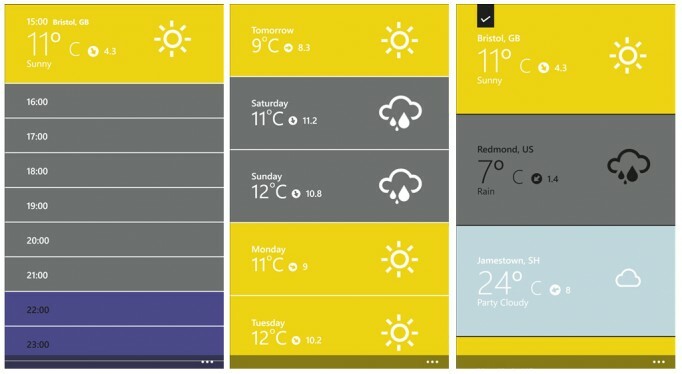 But according to us, it’s got the most attractive live tiles which look very slick and one up every other weather app for Windows Phone 8. Get The Weather Channel for its simplicity and ease of use. If you’ve got a Lumia 920, there’s an exclusive augmented reality function too! Another of the big names in the weather forecast business, AccuWeather is a light and functional app that boasts of a lot of information including wind speed, humidity and includes their trademarked RealFeel predictions. It also allows for lockscreen customization, but instead of wallpapers, it basically replicates how the sky would look, so it’s a matter of preference, really. The only downside we feel is that the live tiles aren’t too attractive and adopt a dark theme no matter the weather conditions. 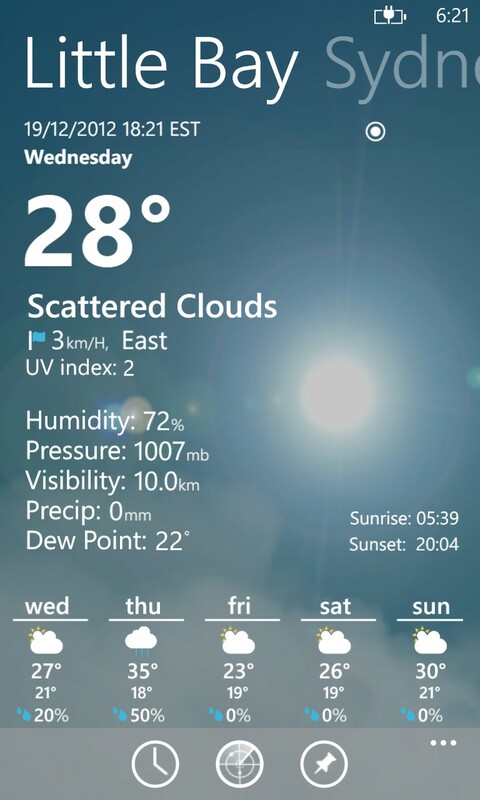 Otherwise, it’s a great weather app for Windows Phone 8. WeatherFlow is something like a cross between Amazing Weather HD and The Weather Channel in terms of features and usability. It updates your lockscreen with appropriate weather based wallpapers and has a great looking main UI, albeit without animations. The live tiles are also very attractive and the app itself is very informative, just like The Weather Channel. It’s also one of the most popular weather apps for Windows Phone 8 on the market, which is no surprise considering how it looks and performs! Last but not the least is The Forecast, a complete opposite of most apps on this list. It has a super minimalistic interface and displays basic information that everyone can use and understand. Also included is lockscreen support and live tiles, but its very barebones compared to the competition. Forecasts are also color coded, so you know what exactly the weather is or will be at a glance. At just 1 MB, it’s also the lightest weather app for Windows Phone 8 so it won’t take a toll on resources either. 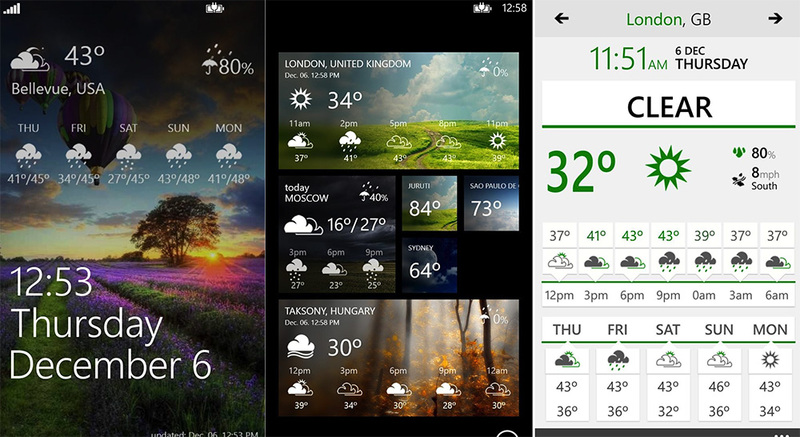 So those were our picks for the top 5 weather apps for Windows Phone 8. Have you got any other apps that you think should be on this list? Let us know!